Ailsa Sutcliffe, one of the GSA Archives and Collections volunteers currently researching the GSA WWI Roll of Honour, talks about her work and what she has found out about one individual in particular. One John Charles Lamont. Researching the Roll of Honour’s men can be a fairly tricky task. It involves a lot of patience, determination and an ability to emotionally navigate the brutal reality of the First World War. Occasionally, however, one of the names typed in to Ancestry.com produces an abundance of results, and with them clues in to the true person behind the title. One of such names was a John Charles Lamont. Until then the majority of the men I had compiled biographies for had yielded limited and generic results. They had all either died in combat or had such common names that they were impossible to trace past their involvement in the war. On an off chance, as I did with all names, I Googled Lamont to see if anything popped up. To my surprise multiple results suggesting he was a relatively well known artist immediately appeared and, upon clicking the first link (here), discovered he had moved to Kirkcudbright after the war and, along with many, many other Glasgow School of Art graduates, had joined the flourishing artists colony that had been established there in 1880. I soon uncovered an intriguing and lifelong alliance between Lamont and a fellow student, Robert Sivell. Lamont was born in Chryston, North Lanarkshire on the 2nd of September 1894 to Annabella Lamont (nee Turnbull) and John Lamont, a doctor. He was a successful, full time student of Drawing and Painting at The Glasgow School of Art between 1912 and 1914, obtaining a travelling scholarship that he never had the opportunity to utilise due to being called up to service with the Royal Tank Corps (the Roll of Honour mistakenly lists Lamont as serving in the Motor Machine Corps, one of its many errors), eventually being promoted to the rank of Acting Corporal. Many sources state that Lamont suffered a severe injury during his service. In fact, I found it incredibly difficult to find any record of such injury; nothing was stated on the war records that I could access online and no literature, printed or digital, contained any explanation of the injury’s nature. Frustrated, I emailed the contact address listed on the Artists Footsteps website where I had initially heard of the injury, and was directed to David Devereaux, curator of the Stewartry Museum in Kirkcudbright, where Lamont had come to reside following his discharge from service. David kindly jumped in to action and informed me that a personal archive had been donated to the Harbour Cottage Gallery by Lamont’s daughter, and that it contained a scrapbook which could help us discover the truth behind Lamont’s ailment. 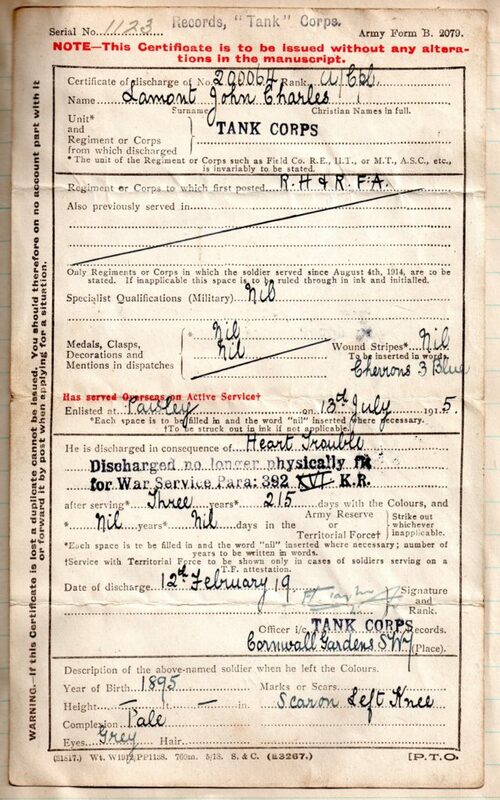 Several fascinating emails later, he told me that he had found a discharge certificate which showed he was discharged from the Tank Corps on the 12th of February 1919 on account of being ‘no longer physically fit for War Service’ due to ‘Heart Trouble.’ The certificate offered a section for ‘wound stripes’ which would have been worn on the sleeve of a soldier, but ‘nil’ were present indicating he had not been wounded. His wartime ’injury’ or illness that caused Lamont’s discharge haunted him with bouts of poor health for the rest of his life. Suffering from rheumatoid arthritis at a young age, he found it increasingly difficult to paint and eventually could only walk with the aid of two walking sticks. Surrounded by artists and creatives in Kirkcudbright, it must have been an incredibly frustrating and isolating experience for him. Lamont died in Kirkcudbright at the age of 53 due to cerebral thrombosis. Robert Sivell, his close friend and brother in law, signs his death certificate. 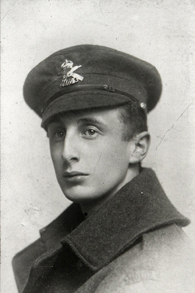 The next part of John Lamont’s story will be released next week in ‘John Charles Lamont and the GSA WWI Roll of Honour – Part 2: Robert Sivell!